Smile! It makes everyone in the room feel better because they, consciously or unconsciously, are smiling with you. Growing evidence shows that an instinct for facial mimicry allows us to empathize with and even experience other people's feelings. If we can't mirror another person's face, it limits our ability to read and properly react to their expressions. A Review of this emotional mirroring appears February 11 in Trends in Cognitive Sciences. 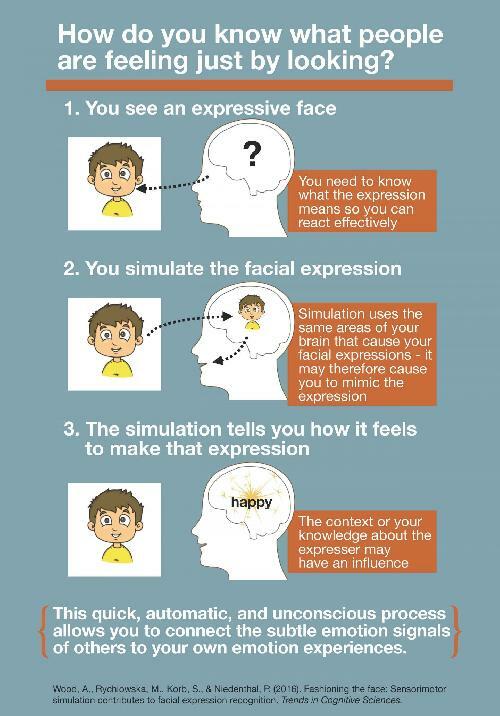 In their paper, Paula Niedenthal and Adrienne Wood, social psychologists at the University of Wisconsin, and colleagues describe how people in social situations simulate others' facial expressions to create emotional responses in themselves. For example, if you're with a friend who looks sad, you might "try on" that sad face yourself--without realizing you're doing so. In "trying on" your friend's expression, it helps you to recognize what they're feeling by associating it with times in the past when you made that expression. Humans extract this emotional meaning from facial expressions in a matter of only a few hundred milliseconds. "You reflect on your emotional feelings and then you generate some sort of recognition judgment, and the most important thing that results is that you take the appropriate action--you approach the person or you avoid the person," Niedenthal says. "Your own emotional reaction to the face changes your perception of how you see the face, in such a way that provides you more information about what it means." A person's ability to recognize and "share" others' emotions can be inhibited when they can't mimic faces, even from something as simple as long-term pacifier use. This is a common complaint for people with central or peripheral motor diseases, like facial paralysis from a stroke or Bell's palsy--or even due to nerve damage from plastic surgery. Niedenthal notes that the same would not be true for people with congenital paralysis, because if you've never had the ability to mimic facial expressions, you will have developed compensatory ways of interpreting emotions. People with social disorders associated with mimicry and/or emotion-recognition impairments, like autism, can experience similar challenges. "There are some symptoms in autism where lack of facial mimicry may in part be due to suppression of eye contact," Niedenthal says. In particular, "it may be overstimulating socially to engage in eye contact, but under certain conditions, if you encourage eye contact, the benefit is spontaneous or automatic facial mimicry." Niedenthal next wants to explore what mechanism in the brain is functioning to help with facial expression recognition. A better understanding of the mechanism behind sensorimotor simulation, she says, will give us a better idea of how to treat related disorders.